We are able to take two kinds of non-production orders: Special Orders and Custom Orders. Special Orders are those color combinations that we do not have available in our workshop for immediate purchase and need to be set for production. Custom Orders are those that require modifications to existing patterns for different widths, ankle, arch and calf sizes. Custom orders can also be taken to modify boot designs with different toes or a special cuff. For any order, it is always best to try on a boot at a festival to ensure that we have the correct length sizing of the boots. To begin the Custom Order process we need your sizing and measurements. We offer exchanges for boots of equal or greater value. Exchanges will be made for boots found to be in a NEW AND UNUSED condition (fit for resale as new.) Any wear on the sole or scuffing on the leather will make us unable to exchange your item. Exchanges are to be accompanied by an original sales slip, plus the cost of shipping, if any. **PLEASE NOTE: There are no exchanges for Special Orders and Custom Orders that have been designed specifically for your foot with custom measurements. Please contact us at [email protected] for any questions regarding our exchange policy. Unfortunately, due to the unique nature of custom and special orders, we cannot offer exchanges for any Custom Orders and any Special Orders with unusual color combinations. 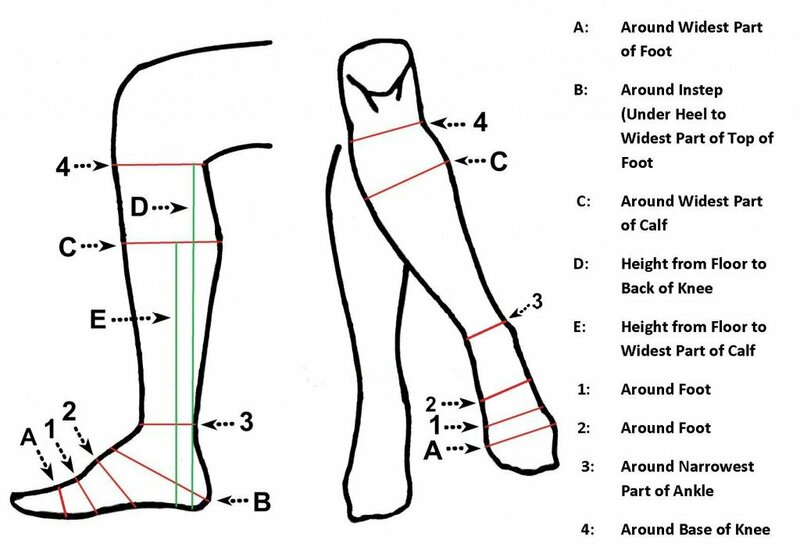 Custom orders are uniquely designed for your foot and calf measurements. Please be sure to be properly sized before placing the order. 1. We obtain all the information for processing the order and confirm the order. 2. Payment must be paid in full before we begin production of your order. 3. We slot in your order for production. Completion of an order depends largely on timing of your order and our production line. 4. Once production starts, your boots typically take between 8-12 weeks to complete. 5. Upon completion you will be notified via email of your UPS tracking number.